I’m going to try and watch the local news over the next few days. I’ll be looking for reports of folks performing strange contortions under street lights and near air conditioning vents. If I do see any, I’ll know what it is about though. 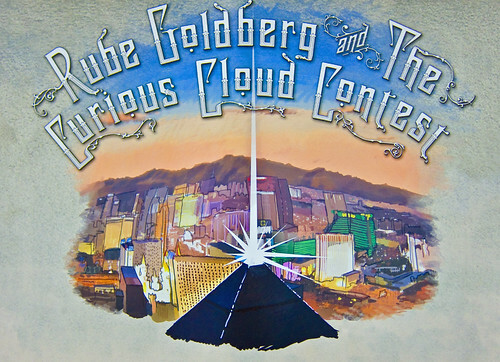 They’ll be people taking part in the Rube Coldberg Curious Cloud Contest. The idea is simple enough. You get a magic device that responds to temperature, light and motion. By getting the right conditions of these you can get three lights on the device to come on. This makes you a winner. It turns out that, with a bit of experimentation, anyone can get the lights to come on (particularly if they take a look at the C# code that powers this .NET Micro Framework based contraption). 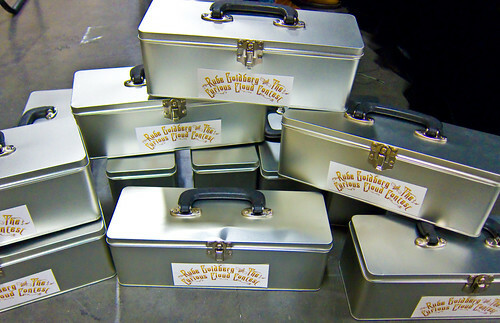 So the biggest prizes go to those who can make them come on in the most interesting way. Dressed as a chicken perhaps, or using a robot, or on the street. Or all three. The hardware doing all this is pretty impressive. 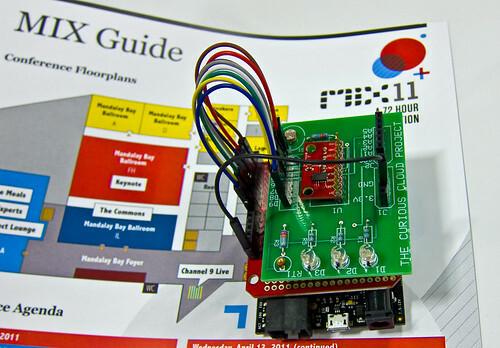 A netDuino board sits at the bottom, talking with a WIFI adapter and a sensor/display board. It captures readings from the sensors to an on-board memory card. When the device is able to detect a WIFI signal it will upload all the recent readings to the Cloud, where anyone can take a look. So, in a package around the size of a cigarette pack we have a .NET capable processor, sensors, data logging and wireless networking. I’ve not found the magic values yet, but I reckon the fun is in the journey. Colin Miller, of the .NET Micro Framework team, is dishing out complete kits to lucky Mix delegates who want to form a team and want to have a go. He will be on hand from tomorrow in the Connect Lounge (at Shorelines A) dishing out kits for you to play with. The kits are beautifully presented, with all you need to get started, including a battery pack so you can take your sensors out and about. You could even use a Windows Phone app to visualise your results. Find out more at http://curiouscloudcontest.com when the competition opens tomorrow.